The weather is starting to warm up in Kentucky and I’m looking forward to spring biking and 5K’s with the family. What I’m not looking forward to is the soda and fast food marketing that so often shows up at these events. McDonald’s Golden Arches are prominently on display for the Walk/Bike Summit and Kids Legacy Triathlon. 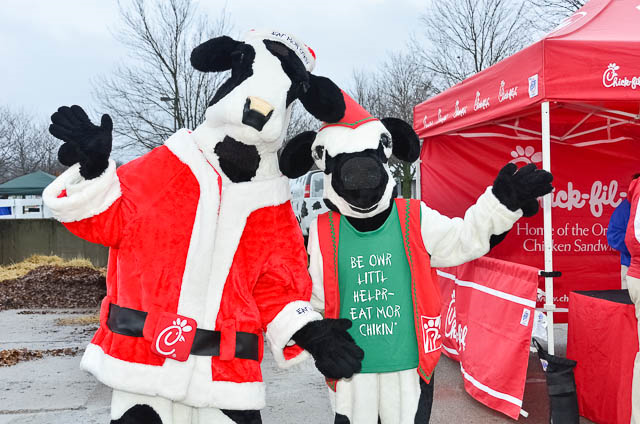 In addition to marketing to kids at school, the Chick-Fil-A cows have popped up at the Girls on the Run 5K and passed out coupons for free milkshakes at the YMCA 5K. When I finished the Bluegrass 10,000, it was disappointing to see the water came in a Pepsi cup. Surely the $30 registration fee is enough to cover 4¢ for a cup without a soda company logo. This weekend I was looking forward to our family participating in the Fayette County Public Schools 5K to benefit the American Cancer Society until I saw it was sponsored by Ale-8-One, a local soda company. I couldn’t stomach the idea of us participating in a race for cancer sponsored by a company whose product is linked to an increased risk of cancer. I want my children to know they can reduce their risk of cancer by as much as 30 to 40 percent by making healthful food choices. I want them to make that connection between diet and cancer but having a soda company sponsor the 5K undermines the American Cancer Society’s guidelines for prevention. Kentucky’s children need to have this message reinforced and not undermined since boys drink an average of 81 gallons of soda a year and girls drink 61 gallons. Unfortunately, it’s getting harder and harder to find fitness activities for my children that don’t include soda or fast food marketing. Why am I so adamant about avoiding this? Because children are vulnerable to marketing. Can’t I just educate my children? Jennifer Harris, a mother, former marketer and psychologist says that’s not enough. Educating kids will not solve the problem. It would be great if we could solve the obesity crisis by teaching kids about nutrition. But I don’t know any kids who don’t already know that they should eat fruits and vegetables instead of potato chips and cookies – yet advertising has helped convince them that the unhealthy stuff tastes better and is more fun! Teaching media literacy to kids is another potential solution that no one could object to – but there’s also no evidence that kids can learn to defend against the psychologically-based tactics that companies use to appeal to young consumers. The only sure way to protect children from the harmful effects of food marketing is to reduce their exposure as much as possible. That is the most important thing I wish I’d known when my kids were young. The soda and fast food marketing at these fitness events undermines parents’ efforts to reduce children’s exposure to food marketing. It also promotes the myth that it doesn’t matter what you eat, as long as you exercise it off. Dr. Robert Lustig begs to differ with this “a calorie is a calorie” message. As we become more aware of the food industry’s role in the rise of diet-related disease, they continue to ramp up their corporate social responsibility (CSR) campaigns which echo the tobacco industry’s use of CSR. Critics, however, portray CSR as primarily a public relations strategy designed to achieve “innocence by association” as corporations align themselves with good causes to burnish their public image and protect their core business. Corporations may use CSR to improve their standing among consumers, the press, legislators, and regulators who make policy decisions about the company and its products. CSR initiatives are often introduced when corporations fear a threat to their profitability, because CSR can boost a firm’s bottom line both directly through sales and indirectly by moderating the risk for regulation and improving the overall business climate. Michael Mudd, former executive vice president of global corporate affairs for Kraft Foods, had this to say about it. Next time you hear of a big food or beverage company sponsoring an after-school physical activity program in your community, you can be sure they’ll say it’s to show “our company’s concern for our kids’ health.” But the real intent is to look angelic while making consumers feel good about the brand and drawing attention away from the unhealthful nature of the company’s products. “Posing for holy cards,” as one of my colleagues used to put it. If you’re planning a fitness event, look for sponsors that fit with the purpose of your event and pass on those looking for “innocence by association.” If you’re a parent who wants to encourage physical activity for your child, look for events with sponsors that don’t undermine your messages about good nutrition. Tags: 5K, biking, Chick-fil-a, fast food, mcdonald's, pepsi, soda, triathlon. Bookmark the permalink. I totally agree. It seems to negate the point when you’re refueling after a run or other sporting event with sugar laden drinks. I was thrilled to read that a independently owned Louisville restaurant removed soda from their menu. There’s hope! Thanks for the feedback and I hadn’t heard about the Louisville restaurant. Good to know!